The cables are designed for use in access or trunk networks, from telephone exchange to subscriber area. The cables are suitable for installation in ducts, direct burial in the ground and also for aerial installation with integral suspension strand.Jelly filled option is for subscriber’s cables installed underground or along the edge of pavement. An armoured option is offered for direct burial installations where additional mechanical or rodent protection is required. A figure-8 self support option is offered for aerial installation. 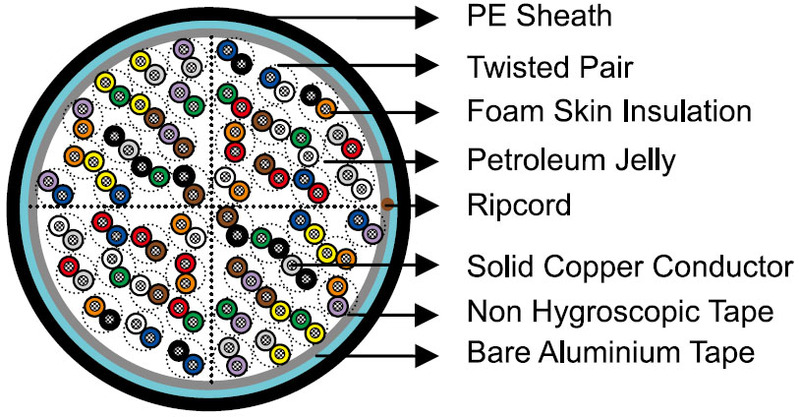 The cable core interstices are filled with petroleum jelly to avoid longitudinal water penetration within the cable.